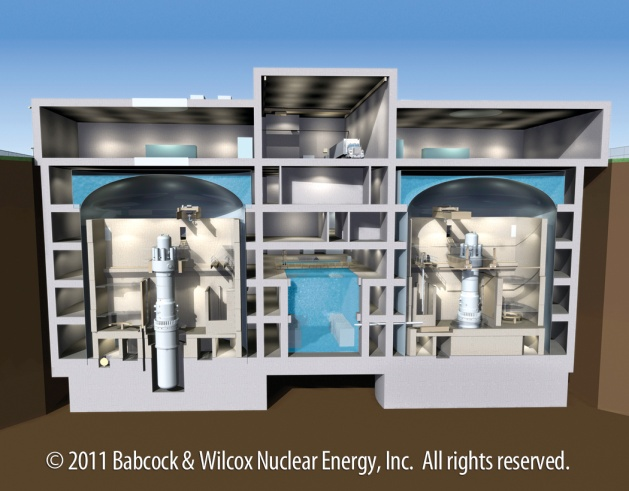 Here is an example of the technology we are talking about: the Babcock and Wilcox mPower reactor. Each unit is 180 MWe, suitable for modest growth in overall load, or progressive, staged replacement of fossil baseload. Anything up to 10 of these modules can be built in series to form a much larger plant. The mPower reactor is designed to be housed and contained underground. This is both a great safety feature, and a wonderful visual selling point for those concerned about nuclear reactors. Remarkably, it will only require refuelling once every four years, and the design provides provision for on-site storage of spent fuel for 20 years and the module has a service life of 60 years. Conceptual SMR site plan, with two below-ground reactor modules in the nuclear island (left side, white building). At the very small end of the spectrum is the Gen4 Energy Power Module at 25 MW. This type of size would be ideal to power around 20,000 homes (equivalent to 115,000 rooftop solar PV systems), especially in remote locations, or provide reliable district power to hospitals and other major precincts. This design is intended to be returned to the factory, intact, at the end of a 7-10 fuel cycle for decommissioning. At this level we can start talking about the notion of nuclear batteries! 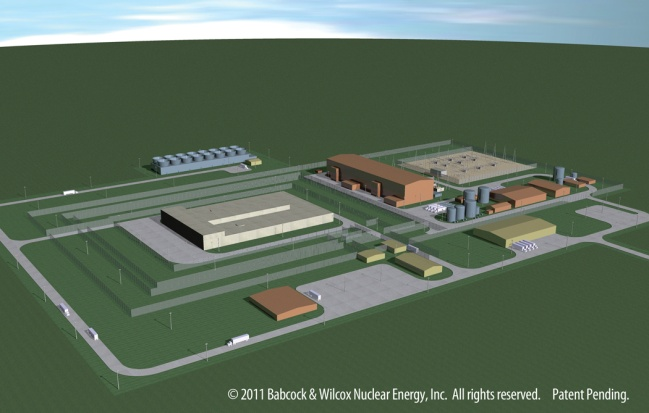 All of the new SMR designs have applied the most up-to-date passive safety systems, meaning the safety of the reactor is in no way tied to external power sources. The units themselves will standardised designs, factory made and delivered by ship or rail to the installation site. They are streamlined designs, with both the reactor and the steam generators held within one compact containment. This again makes them very safe. Fewer systems means fewer potential problems. Cutaway of a single reactor, showing fuel assemblies (bottom), the steam generator (middle) and the pressurizer (top). This is emergent technology; we cannot pick up the phone and place an order for a small modular reactor. But its potential value has been recognised through the commitment by the United States Department of Energy of $400 million and a federal site at Savannah River National Laboratory to support the design, licensing, commercial demonstration and manufacturing of SMRs. There is huge benefit to be had from these new designs that improve the versatility of nuclear as a provider of zero-carbon baseload electricity while capitalising on major advances in safety and low-cost production. Somewhat perversely, the fact that Australia is currently so far behind in preparedness for nuclear generation (it is currently illegal under the EPBC Act), might mean that we will be well placed to move straight into these designs as they hit the market. Small may be useless when it comes to tackling climate change. But smallish nuclear reactors, which still manage to pack an enormous energy punch, could play a big role in hastening the costly transition from aging fossil plants to super reliable, super safe and super compact new zero carbon generation.